Okay, so just a little programming note here at the top- today’s previously scheduled set review has been pushed back a week in light of recent events. You know exactly what I mean. Today is going to hinge on the announcement of Magic’s new Masterpiece Series, the various impacts it has had and will have moving forward, and then we will talk about the offerings in the Kaladesh edition in particular. My expectation right now is that future Masterpiece editions will not require an entire article, but we will see how that shakes out in a year from now. Okay, so… wow. 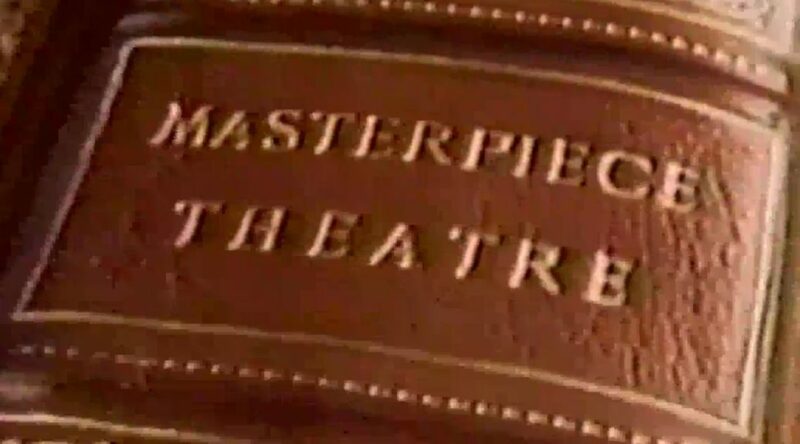 The Masterpiece Series. Huh. Standard is the most-played Constructed format. It’s designed as an entry point for players who wish to play Constructed Magic. Through market research and social media, we learned that many of the players who were interested in playing Standard felt it was something beyond their reach. We had to find ways to address this. …we found that Zendikar Expeditions drove more players into the Battle for Zendikar block, which resulted in greater accessibility for all the non-Expeditions cards. Zendikar Expeditions actually made it easier to play Standard. Hmm, a way to address challenge #1. I don’t want to pull too much from my original piece for this week, the Standard Set Review, but I think its important to realize that a major driver of the Masterpiece Series is pushing more people towards participation in Standard. It makes sense, given that Standard has the most impact on WotC, while serving as perhaps the best form of advertising when healthy. While depressing the value of singles makes for a player-friendly format, it only benefits dealers if it generates new or lapsed former players for the market. Even if we see an increase in new players, I’m not sure it will be immediate, nor do I think we can expect the kinds of huge gains that were happening over the last several years. 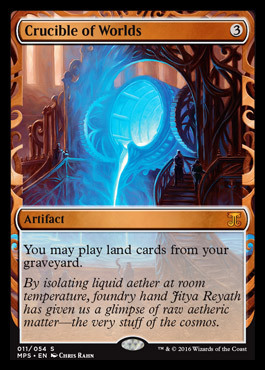 It’s unlikely that another set will sell out the way RTR did, even with the added incentive of potentially opening a sweet StarGate Crucible of Worlds. It kinda looks like a StarGate. Enough people have talked about the short term effects (cheap Standard) by this point, so let’s go ahead and sim forward a few years. 5 YEARS OF MASTERPIECES: My guess here is that outside of a very few cards (design or development flaws, a la Collected Company), we are not going to see many new cards hold much value after rotating out of Standard. Masterpieces will slowly be “normalized” in the sense that focus will trend more towards a few inclusions rather than the appeal of opening one at all. I expect player growth to be plateauing by this point. 10 YEARS OF MASTERPIECES: At this point, it’s likely that the Masterpiece Series is suspended OR has evolved over time in ways that are difficult to predict. The Kaladesh Series only includes 5 cards from the set itself (the marquee “titans” of the block), but I suspect that that ratio of new cards to old cards may shift as the viable reprints winnow. WotC is likely going to have to swing harder as the years go on, just because pricing will likely become normalized. Preorders for Zendikar Expeditions were wild because it was new territory, in 2026 it’s likely that the financial algorithm is largely solved. Call me crazy, but it’s possible that Hasbro and WotC slowly start to peel back Reserve List restrictions and that in a theoretical distant future there are Masterpiece Underground Seas. This is assuming that player numbers REALLY suffer to a point where the game has contracted significantly. This is an ‘Artifacts Only’ set. There are 24 inclusions in Aether Revolt, 2 of which are Swords, and likely 5 of a new cycle. 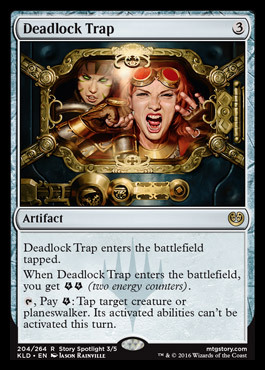 WotC is not afraid to include constructed staples (Aether Vial) or otherwise unsupported mechanics (Metalcraft). Flavor is a meaningful factor. So we can expect very straightforward themes, at least in the short term, hinging on things that are both easy to boil down while staying in theme with the world. Kaladesh is an artifact-centric plane, so the Masterpieces are literally exhibits at the county fair or whatever. Some of the cards were re-flavored better than others (isn’t Brighthearth a place? ), but mostly everything fits in well with “artifact only subset” and “Kaladesh County Fair Exhibit”. 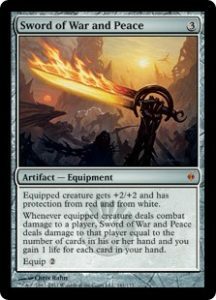 There can and will be split cycles, even though WotC probably messed up by putting two of the worst swords together by themselves in the second set. I’m not saying that this is the worst sword, but it’s not the best. Just as Oath had some REALLY spicy Expedition lands compared to BFZs straightforward cycles, I expect to see some more aggressive printings there as a means of bolstering a smaller set. Aether Vial is an interesting choice because it is almost exclusively played in formats where it is at a 4x. Just as utility spells (like Char) were singled out as “mostly going to stay at rare” when mythics were announced, it is interesting to see that not all Masterpieces will just be EDH upgrades. This creates a situation where some Masterpieces are wanted in multiples, compared to things like Mind’s Eye, which will be wanted as individual copies. Expect much higher prices here as people compete to complete sets. Flavor and commitment to theme kept out things like Phyrexian Metamorph and Arcbound Ravager, but Metalcraft was not an issue. This means that as long as the textbox is the only restriction, it’s likely that cards that otherwise wouldn’t make the cut are able to fudge their way in. I’m not sure its worth speculating on what may be in Aether Revolt (other than the two swords and some number of currently nonexistent cards), but is it fair to say that I expect it to be the “better” of the two? Also, I don’t think it is going to be wise to try and bet on what will and what won’t be included in a set. My advice is to just avoid any big risks until this problem is solved. Ironically, this means gravitating MORE towards Reserve List staples and smaller newer stuff with a higher sale velocity. Let me know what you think about these, and your thoughts on the Masterpieces in general. We’ll talk about the REAL Kaladesh set starting next week, including this card which seems to have a rejected Paramore album cover as the artwork. That’s what you get when you let your heart win. PS- I’ve been on a big MST3K binge literally since the announcement of Servo tokens, and Club-MST3K.com has every episode for free with no commercials. This is my way of circulating the tapes in 2016.